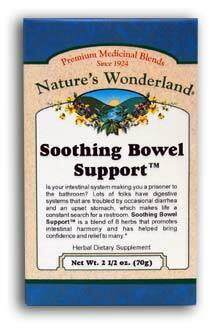 Soothing Bowel Support™ Tea, 2 1/2 oz (Nature's Wonderland) - Penn Herb Co. Ltd.
CINCHONA, BIRCH & SHEPHERD'S PURSE…promote intestinal harmony, soothe gastrointestinal distress. LICORICE ROOT…helps soothe the irritated lining of intestinal walls. BLOOD ROOT, CELANDINE…ease abdominal muscle spasms. GOLDENSEAL…soothes bowel, digestive & gastrointestinal discomforts.